Happy New Year!! I'm starting the year off, posting some samples made with the newly released Lizzie Anne Designs Simply Singles. My first sample uses Love You a Latte. I've made a little 3 x 6 card using some random patterned papers from an unknown collection (gift with purchase from Eclectic Paperie). I've pieced my cup and saucer with Blushing Bride, and pieced the latte fluid with Copic-colored white paper and some Liquid Appliqué. This time I've puffed the Appliqué with my heat tool, and it looks yummy! Isn't that little heart-shaped foam just darling? Up next is a more masculine card featuring the new Wise Man's Treasure single. I've used Crumb Cake and my Basics White Pad of patterned paper from BasicGrey. The dies I've used are both from My Favorite Things Die-namics collection. Bitty Brads from CTMH are used to accent the label. Super cute Rose Ann! You know this girl can't resist coffee images! awesome cards RoseAnn! I love the heart shapes in the cocoa! Love both of these!! Happy New Year to you and your family! 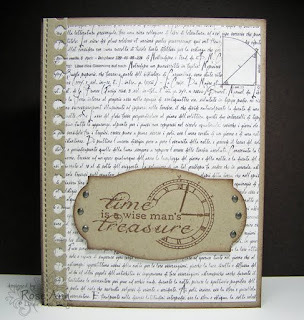 Love your note book die, looks FAB!! What a clever use of the LA for the latte! Mmmmmmmmmmmmmm! Happy New Year, Rose Ann! Totally fabulous designs Rose Ann! I especially love the Latte card . . . yummy! Two sweet cards! Going to make myself a coffee,even though that latte looks yummy,thinking,too many calories! Lol! Got your beautiful card last friday I guess,but just went to the mailbox today.Thanks so much! I didn't have the energy to make lots of cards this year and couldn't send one and not to all my blogging buddies so will catch up next year! 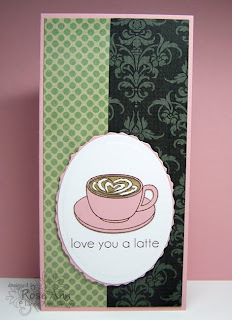 Yes, that heart in the foam is adorable, especially with the applique! Love the masculine card, just perfect for a husband. Love the heart in the coffee cup! Cute idea to use LA. Happy New Year! Very cute Rose Ann! Love the masculine time stamp and the notebook end! Yes, that heart shaped cream is too cute! Love the papers, too! Your 2nd card is so perfect for a man - I especially love that stamp on the shaped die! Of course I love the colors, too! these are both great. l love that coffee cup image and your second card is perfect. Lovely! My fav is the one with the BG paper...that is a neat way to use that collection! Great set of cards Rose Ann, love that cup of latter image, it's keeping me warm right now in this freezing cold... Happy New Year to you my friend, all the best to you! Oh Rose Ann, these are beautiful! Love seeing new goodies! Lovin' the LA in a yummy heart shape. Great masculine card, too. Happy New Year, Rose Ann! The cup is so cute the way the swirlies form a heart! Love that! Love the CAS layout with the pretty papers, too. Your second card is utterly perfect for the image/sentiment, too. I have to say I can really identify with the statement that time is a treasure. I'm not a wise man, but any moment of unclaimed time is certainly something to treasure.